Work-based learning creates a link between education and the workforce. Work-based learning can include apprenticeships, internships, and career technical education (CTE) classes. This partnership benefits students as they finish their education and, also, as they transition from a classroom to a career. Through work-based learning education, students develop employability skills such as cooperation, understanding, and motivation. These skills will help students as they search for post-graduation employment opportunities. Students get a head start in developing career awareness and work-related habits that they will need in future careers (Why Does Employer Engagement Matter?, pg. 7). Also, work-based learning encourages students to stay in school because each student can learn skills in their own areas of interest. The benefits from work-based learning continue as these students enter the workforce. The employers hire workers that are prepared for a workplace environment and require less training. According to a survey by the Urban Institute, 80% of businesses that sponsor apprenticeship programs found that the program was effective. The same survey found that 94% of these businesses would recommend apprenticeship programs to other companies (Wilson and Mehta, 2017, pg. 3). Also, work-based learning allows workers to find careers that best fit their interest which will improve worker engagement and efficiency in the workplace. In the United States, thirty-five states, as of 2017, have programs that support work-based learning (Wilson and Mehta, 2017, pg. 3). Work-based learning allows communities to come together. The local economy becomes more productive as workers find jobs that best fit their skills. Also, by allowing students to develop these skills in high school, the unemployment rate will decrease within communities because there will be a trained and available workforce without workers having to seek higher education. Work-based learning prepares students to transition to the workforce through hands on learning. The skills learned during these programs follow the students into their future careers. Although some training is required for any job, work-based learning programs prepares workers to learn new skills and to use the skills developed more effectively. 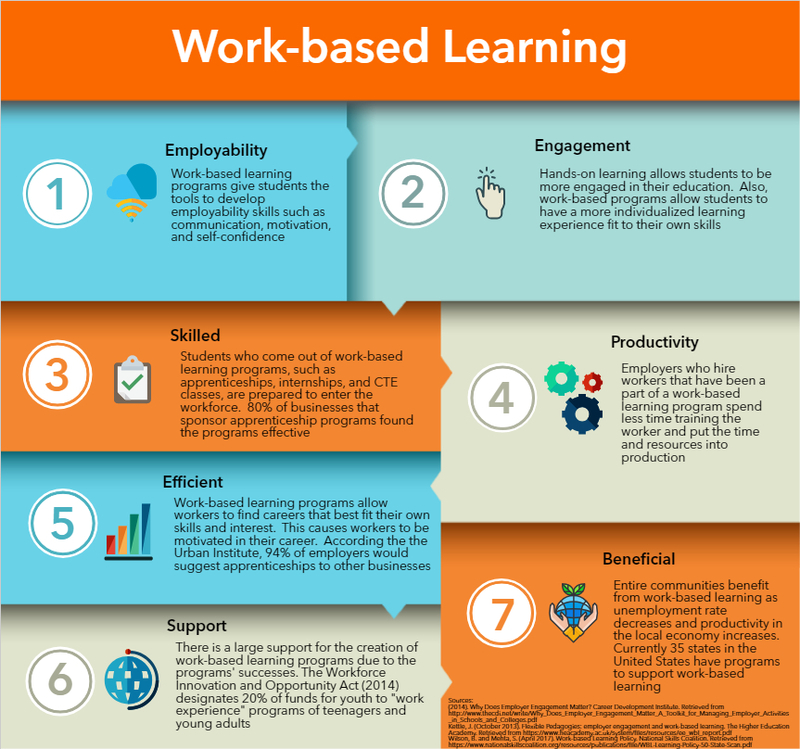 Work-based learning programs create engaged students, productive workforces, and efficient communities. Why Does Employe Engagement Matter? Provide young people with the opportunity to ‘learn by doing’ and to learn from experts. Increase the commitment to learning, motivation and self-confidence of students. Improve the retention of young people in learning after the age of compulsory schooling. Develop career awareness and the ability to benefit from impartial and informed information and guidance. Develop the ability to apply knowledge, understanding and skills. Improve understanding of the economy, enterprise, personal finance and the structure of business organizations and how they work. Encourage positive attitudes to lifelong learning. Work-based learning allows students of all ages to get an insight into a career or occupation which can be a key step in the pathway to a fulfilling career. Quality work-based learning programs benefit the students, employers, schools, and the community.